I was born in Henderson , Nevada in 1954 and grew up in Boulder City . I moved with my family to Buckeye, Arizona in 1967 and have lived in Arizona ever since. You can see my preference for native southwest forms in my work. I live in Phoenix and am a member and a past president of the Arizona Woodturners Association (AWA). 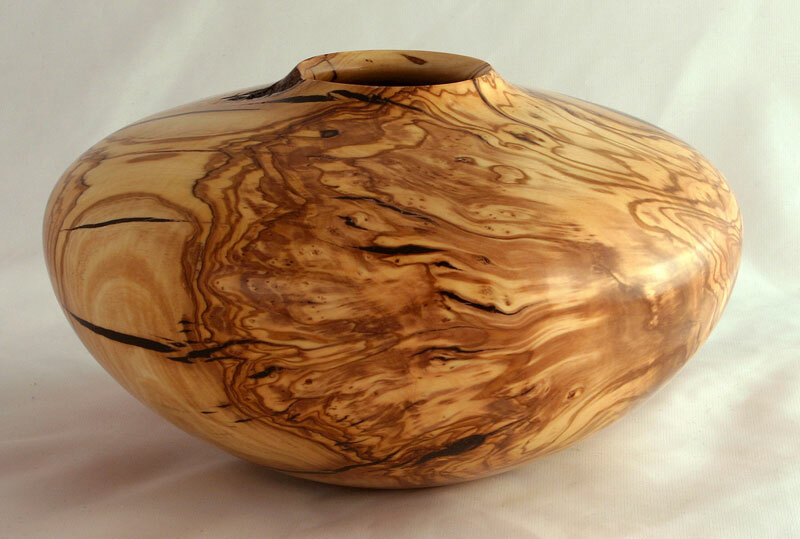 I am a member of the American Association of Woodturners as well. I have worked in the graphics industry for the past 30 plus years and am currently a graphic designer for a microelectronics company in Phoenix , AZ. I remember doing a lot of turning in high school and still have the first piece I turned, a leg for an elevated cutting board. In the late 1980’s I started taking an adult woodworking class to make round frames for stained glass art I was doing at the time. The class was sponsored through a local community college and was held in the wood shop of a nearby high school. The classroom was small with about 25 students. I sometimes had to wait in line three people deep to use one the big pieces of equipment (table saw, band saw, etc. ), but they had five nice lathes that nobody ever used. I remembered how much fun it was to turn and started bringing in scraps of wood to practice turning. 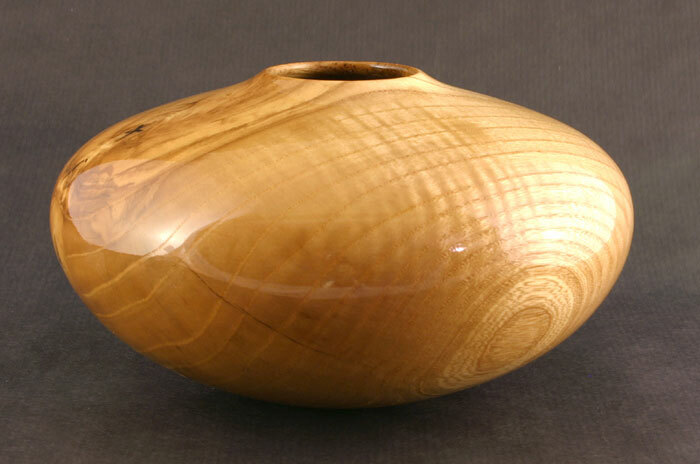 Soon after that, the instructor showed me an article in Fine Woodworking about segmented turning. I thought I’d give it a try and made some real crude segmented hollow forms. I thought it pretty neat to be able to turn a hollow form from a flat board. 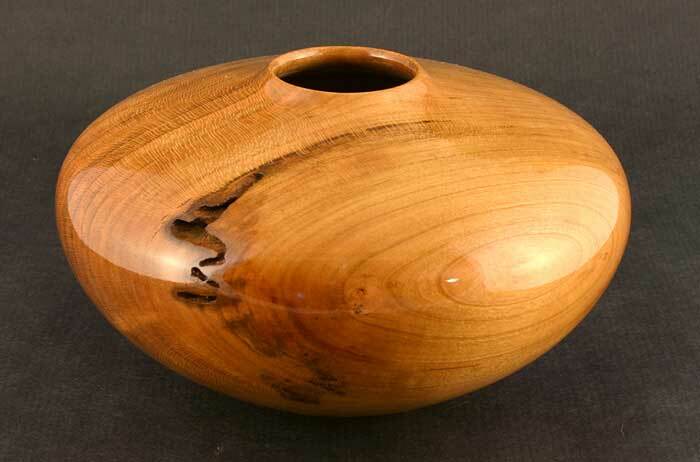 I joined the AWA and learned to process found wood and haven’t done much segmenting since. I had bought my first lathe through a high school auction and have been turning ever since. I currently have a big Oneway and a Jet mini that’s so old it’s blue. I am mostly self-taught. 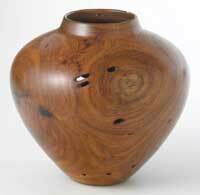 In 2001 I took a woodturning course taught by Phil Brennion (a turner I greatly admire) at Yavapai College in Prescott , Arizona . In a critique of some of my work at time, Phil’s commented that my work ‘looked like it was growing out of the table.’ From that point on, I strive to make a clean fair curve around the bottom of my hollow vessels. Today I use mostly found wood. 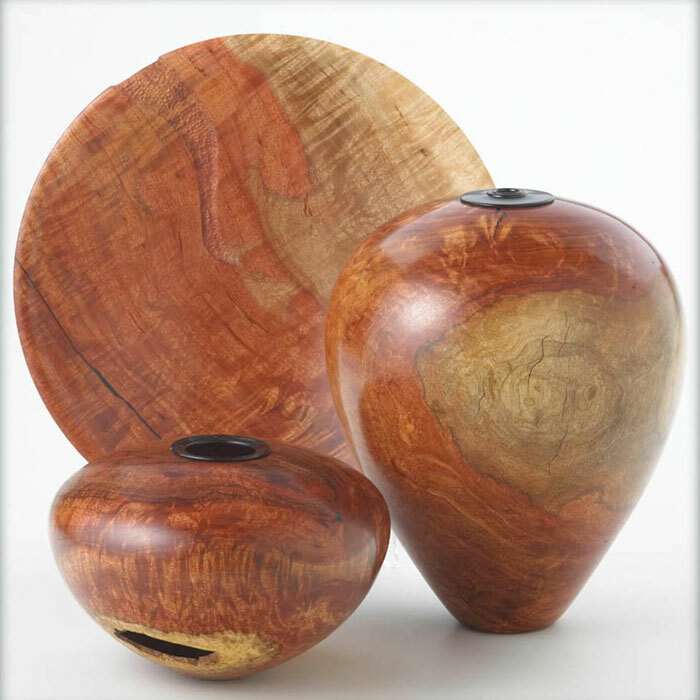 There is quite a variety of wood here in Phoenix thanks to irrigation, mesquite, carob, olive, African sumac, ash, pecan and desert ironwood to name a few. Most of it is not very big, maybe 10 to 15 inches in diameter, but I think the extreme climate conditions give it some tremendous figure. I have work in a couple of galleries in the western U.S. My work is in collections through out the U.S. , Europe and Hong Kong . 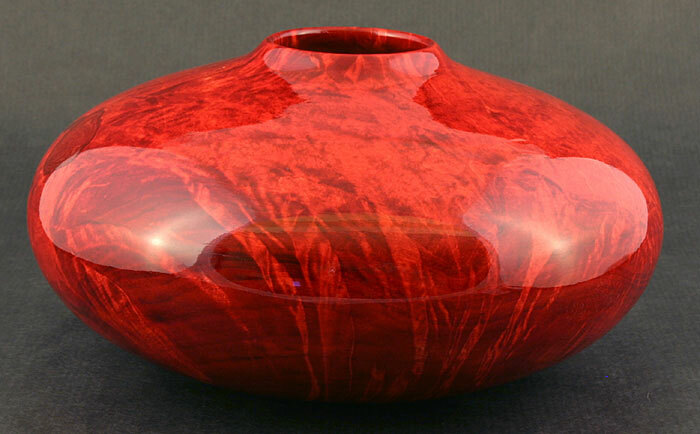 Check out my website at http://paulporterwoodturning.com/ and you can contact me at paul@paulporterwoodturning.com. 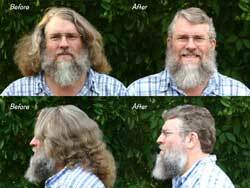 About the photo: My barber of 15+ years was fatally injured in an automobile accident a couple of years ago. I had let my hair grow in homage to him and partly because I was too lazy to find a barber who could deal with curly hair. At about a year and half without a hair cut, I decided to get it cut. Besides it was August in Phoenix , hot and humid. 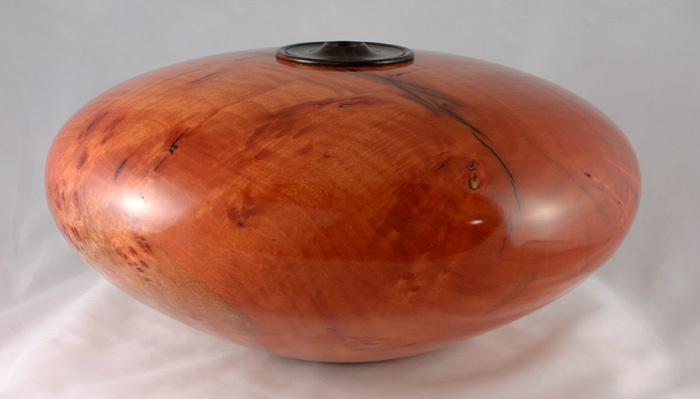 I received this piece of cherry from David Propst in a exchange on Wood Central. 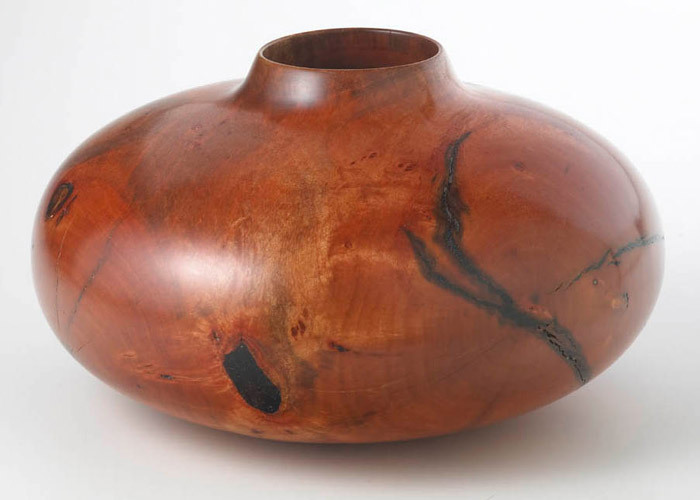 It is 7” D x 4.25” H.
10” D x 8½” H Curly Carob platter - 13” D x 2” H, Curly Carob hollow form with an Ebony collar - 8½”D x 10” H and small Curly Carob hollow form with an Ebony collar - 7½”D x 5 ¼”H. This tree was one of those once-in-a-lifetime finds. It had this incredible curly figure through the entire tree. I have never seen another carob tree like it.